Dundee United have played down the possibility of a link-up with Ukrainian club Shakhtar Donetsk after manager Mixu Paatelainen confirmed an approach. A United spokesperson says it is highly unlikely a deal will happen. The approach came from a third party and is one of a number the club receive throughout the season. "We have not taken it any further yet, but I have to say it is a very luring prospect," former Finland head coach Paatalainen had said earlier. The United manager said it been suggested that it could lead to some young United players heading east, with some Shakhtar players coming to Tannadice. 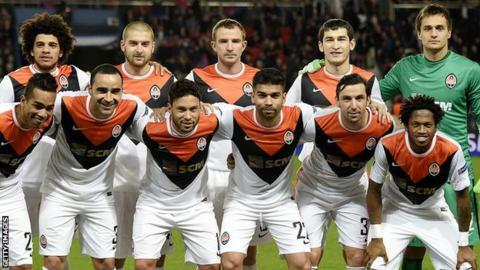 Shakhtar are based in the city of Donetsk, which has a population of nearly one million people in the centre of Ukraine. They were runners-up in their national top-flight last season and Mircea Lucescu's side presently lead the table on goal difference from Dynamo Kiev. The Miners, also known at The Moles, have been regular participants in the Champions League and were third in Group A behind Real Madrid and Paris Saint-Germain this season. "Shakhtar Donetsk are a major force in European football and have fantastic players, experienced players and young players," added Paatelainen. "If there was a working relationship with a top club like Shaktar Donetsk, I think it would be beneficial for the club, but it is at a very early stage at the moment." United, who like Shakhtar play in tangerine and black, are currently struggling to retain their Scottish Premiership status and sit bottom of the table, 10 points adrift of Kilmarnock. Meanwhile, Paatelainen has insisted that Eiji Kawashima will arrive at Tannadice next week after a protracted attempt to sign the Japan goalkeeper. United announced the capture of the 32-year-old in November, but work permit problems have held up the completion of the deal amid suggestions that other clubs are interested. The United manager is hoping Kawashima will not be the only addition to his squad during the January transfer window. "We are hoping to bring in one or two during January," he added. "Whether we are successful with that, we will see, but there will be one or two leaving I expect."